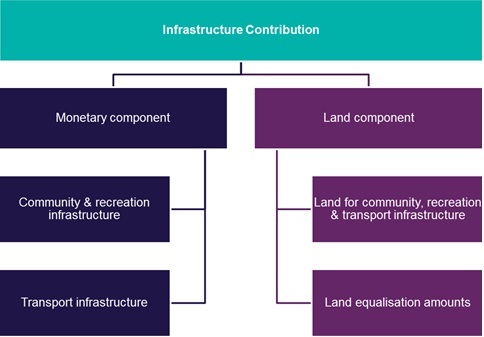 An Infrastructure Contributions Plan (ICP) is the mechanism for imposing an infrastructure contribution in relation to the development of land. The ICP system took effect on 27 October 2016. The system is based on standard levies that are preset for particular development settings and land uses, in order to fund the provision of essential infrastructure that will support new or growing communities. A key component of the system is the preparation of an ICP which must be incorporated into the planning scheme. On 2 July 2018, the Planning and Environment Amendment (Public Land Contributions) Act 2018 came into effect, introducing a land contribution model for the ICP system. The land contribution model enables land for public purposes to be provided as part of an infrastructure contribution when land is developed. This replaces the monetary component of the standard levy for public land. The ICP system applies to metropolitan greenfield growth areas – the first of three identified development settings to have the new system applied, with regional growth areas and strategic development areas to be added later. Section 3AB of the Planning and Environment Act 1987 (the Act) sets out the provisions governing the preparation and imposition of infrastructure contributions. The Ministerial Direction on the Preparation and Content of Infrastructure Contributions Plans specifies the development settings and the details of the new system, such as levy rates, indexation methodologies, allowable items and how land is provided. Section 46GZI of the Act requires councils to report annually on contributions collected and expended through an ICP. The Ministerial Reporting Requirements for Infrastructure Contributions Plans specifies what councils must report on. When land is developed for urban purposes new or upgraded essential infrastructure is needed to support the new development and its future communities. Infrastructure contributions are provided by developers to help fund essential infrastructure for new communities when they develop their land. What kind of infrastructure is funded through infrastructure contributions? Infrastructure contributions fund basic and essential infrastructure that new and growing communities need, such as local roads, community centres, kindergartens, maternal and child health facilities, local parks and sporting facilities. In some cases, infrastructure contributions can also fund state infrastructure such as public transport. Why are infrastructure contributions necessary? Infrastructure contributions are critical in facilitating Victoria’s rapidly growing population. Infrastructure contributions ensure that when new communities arrive, essential infrastructure and services are in place to meet their needs. What does an infrastructure contribution consist of? A monetary levy – This is a monetary levy that may be used to fund the provision of works, services or facilities (that is, construction of community, recreation and transport infrastructure) and plan preparation costs. The levy may consist of a standard levy, a supplementary levy or both levies. A land component – This is land identified for public purposes, such as land for roads, parks and community facilities. The land may be located within the area to which the ICP applies (‘inner public purpose land’) or outside this area (‘outer public purpose land’). The land component may also consist of a land equalisation amount (depending on how much inner public purpose land a landowner is required to provide under an ICP. The Ministerial Direction on the Preparation and Content of Infrastructure Contributions Plans issued by the Minister for Planning under section 46GJ of the Planning and Environment Act 1987 requires the standard levy amounts to be indexed on 1 July of each financial year in accordance with the method of indexation specified in the applicable Annexure in the Direction. New guidelines will be published shortly. Amendment VC146 to the Victoria Planning Provisions introduced a new Infrastructure Contributions Overlay (ICO). The schedule to the Infrastructure Contributions Overlay is contained in the Ministerial Direction on the Form and Content of Planning Schemes (PDF, 2.4 MB). the use made of any works in kind. prepared and presented in accordance with the standard templates provided in the document. Where a council is the collecting or development agency, the report must also be included in the report of operations contained in the council’s annual report prepared under the Local Government Act 1989. Information about the Development Contributions Plans, the new Ministerial Direction including new reporting requirements and the increased Community Infrastructure Levy is available below.